In the running wearable wars, the battle for our wrists has been raging non-stop for years. The fight for our feet, however, has seen more of the odd sporadic skirmish. We’ve had chips in shoes from Nike and Under Armour, while startups like Sensoria have given us smart socks, but no one has yet convinced us that smart footwear can really change our running. That might be about to change. Arion running is part of a new wave of smart insoles and footpods – including brands such as Stryd and RunVi – that pair biomechanical sensors on our feet with real-time intelligent coaching, to help us run more efficiently, avoid injury and ultimately bag more personal bests. Arion describes itself as a “next-generation wearable that helps runners improve their technique to run faster, longer and safer” and its sensor-laden smart soles track a huge range of running dynamics – the stats that reveal how efficiently we run. It builds up a detailed picture of your running technique and then converts that data, via a smartphone app, into a programme of real-time coached running sessions designed to help optimise your running performance, minimise your risk of injury and increase your overall efficiency. So is this the end for the human running coach? We put Arion to the test for a few weeks to find out. Here's our verdict. 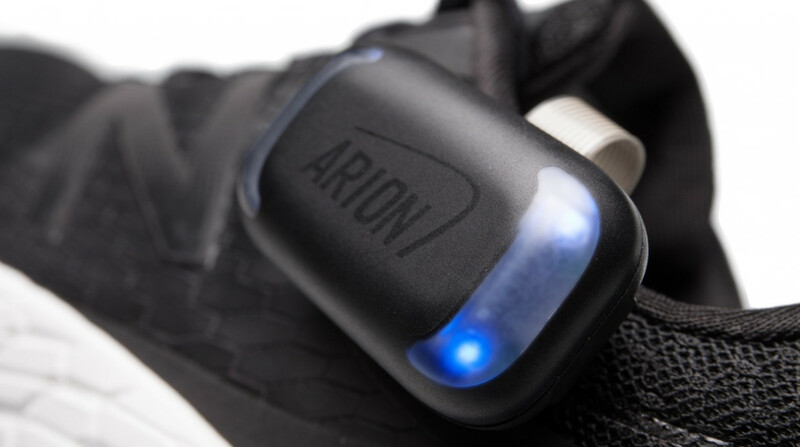 The Arion Pro Pack consists of two smart insoles, two sensor-laden pods (only one of which has GPS), a smartphone app and a web-based dashboard. There’s a starter pack available with just one pod and you can buy individual parts of the system separately, though for full tracking and insights you’ll need to invest in the full kit which will set you back the price of a good running watch, around $303. The 2mm thick insoles come in four sizes: small, medium, large and XL, covering shoe sizes ranging from UK3 to UK13+, and are impressively thin. We tested the large, which fit UK 8–10.5. Hidden in each sole are eight pressure sensors, spread out across the foot to capture what happens with each footstep – for example, which part of your foot hits the ground and for how long. There’s a cable that runs out of the sole near the heel and on the end of that is a connector where the pods attach. Each pod packs a 3-axis accelerometer and a 3-axis gyroscope, plus Bluetooth and on-board memory for data storage, though at the time of testing, phone-free running hadn’t been released yet. We’re told it's on its way soon though. One pod in each Pro Pack also has built-in GPS. On the whole the hardware design works relatively well, though there are some quirks and potential frustrations. The Arion soles slot easily and neatly under your regular insoles, and while we didn’t feel they add any discernible difference to the fit of our running shoes, they do take up some considerable space. The pods and soles together also add anywhere between 35g and 40g to the weight of each shoe. Is that significant? Well, if you’re a runner obsessed with marginal gains who’s paid a premium for lighter running shoes, it might. The pod connector clips securely onto the cuff of your shoe – so tight in fact that you know they won’t fall off during a run. However clipping and unclipping the pods from their connectors, and the connectors from the cuffs, can be fiddly, particularly on shoes with a more padded cuff. Unfortunately, there’s also no auto power off so this is a process you’ll have to do before and after each run with Arion. After a while we also noticed the connector cables were getting twisted and over time we’d worry about wear and tear here. That cable that runs to the pods sits inside the shoe can also occasionally become twisted. It’s a minor frustration and a quick one to fix on the move, but it’s worth noting. Also, if you wear your running shoes when you’re not running – let’s say you run-commute to work but don’t take spare shoes – you’ll need to remove the soles entirely or walk around all day with slightly weird clips hanging over the edge of your shoes. There’s a big question mark over the soles’ durability too. During our test there was significant wear to the foam of the insoles from running, and they didn’t feel like they fared well squeezed unprotected into a gym bag. Arion assured us they were aware of the foam degradation and were working to improve this, trialling different foams. They also said that even though the foam might degrade, the sensors will continue to work and that the soles are under warranty for 1,000km (620 miles) or one year. That’s only 50 miles per month though, which isn’t a huge distance, particularly when you consider this product is likely to be bought by serious runners logging high mileage rather than someone starting a couch-to-5k journey. Arion is waterproof and we ran enough drenched trails to confirm they can happily handle rain and the odd step in a puddle. However, any sustained submersions are off limits. So no aqua jogging, river crossings or wearing them in the shower. The list of metrics Arion tracks is impressive, and probably the most comprehensive array of running dynamics we’ve seen next to Lumo Run. To kick things off, it’ll tell you whether you heel, midfoot or forefoot strike, displaying this in a slick real-time heat map graphic in the app. There’s also step length, cadence, balance, contact time, pace, impulse, stability, flight time and biomechanical load. The latter is also displayed as a graphic, an avatar that shows which muscles have carried most of the load, though this is still in beta. You can also get heart rate by pairing it up with a heart rate monitor. The biggest omission is power, and given the fact that Arion is a foot-based tracking system and there’s a growing trend for running with power, this feels like a missed opportunity. Though Arion can be updated over the air, so it’s possible this might come at a later stage. During a run, real-time stats can be viewed in the partner app or with audio updates via Bluetooth headphones paired to your smartphone. Arion offers a couple of options for runs. The first are free-runs, where you can set your own area to work on and analyse the stats for yourself. However, the second, and the heart of Arion, is an adaptive AI coaching engine that learns how you run and guides your training. And that’s where the really interesting stuff starts to happen. Before Arion’s coaching brain kicks in you need to do a baseline run of up to 10 minutes where it gets to know your running quirks. The next time you open the app, Arion’s coaching engine suggests a metric to work on and determines the target zone for that metric. Much like a heart rate zone training session, all you have to do is try to run within the parameters of the zone, with Arion offering audio prompts when you drop above or below. After the baseline run, the first session Arion recommended was a moderate cadence run with a target of between 152 to 172 steps per minute (SPM). Now according to Lumo Run, which we wore during our Arion baseline run, we hit an average cadence of 177 SPM while Arion clocked an average 164 SPM. Delving into recent run data from Lumo, Stryd and other devices we’ve tested, our cadence is generally somewhere between 160–185 SPM and not an area we feel is our weakness, so this seemed like an odd choice of things to work on first, and an odd target range. After completing that run and clocking an average 167 SPM, we then took a few days rest, eventually firing Arion up three days later. Arion spotted our hiatus and asked for another benchmark run to see if anything had changed. Now we salute the theory here, and checking form after periods of down time seems sensible, but three days is hardly a big break from training and being forced to repeat the benchmark run feels like premature interjection. After the second baseline run, during which we hit an average 160 SPM, Arion then recommended another moderate cadence run with a 152–172 SPM target. And this reveals a problem we had with the coaching. In our tests we were only ever recommended cadence and footstrike runs and it felt like slow, or even no progress was being made. For our next 152–172 SPM cadence session, we ran a faster-paced 6-mile tempo run. At the end of the run, Arion popped up a message that said: “Wow you ran a really fast time. Your average speed increased more than 10%. Whilst positive this can increase the risk of injury.” It then recommend a new Baseline run next time so it could reassess performance and guide us safely. It also recommend easing off next run to give our body time to recover. There’s a lot wrong with this. For a start, running a 6-mile tempo run at an average pace of 7:37 min/miles isn’t even fast for our running ability. Arion might not have had long enough to get to know us yet, but in that case perhaps it should make it clear that more Baseline runs are required. When Arion recommends a cadence run, there’s no mention of pace and so it’s odd to be told at the end of a run that this is significant, to the point where it’s back to the drawing board. Dig into the detail of the run and it gets more problematic. On the immediate post-run screen Arion claimed that we were “10% inside our target zone” of 152–172 SPM but that our average cadence overall was 167 SPM. That immediately feels contradictory. However, dig into the mile splits and, according to Arion, you can see that we ran quite a high proportion of the run at a much higher cadence. But Arion makes no mention of whether this is a good or a bad thing in its post-run summary. We had issues with the real-time coaching too. Arion’s notifications work by telling you each time you drop above, below or back into a target zone and in practice this makes for a lot of interruptions – we’d argue to the point where it becomes unbearable. You can change the audio feedback settings, but this is restricted to a binary on/off for the real-time coaching. The frequency of updates for time, distance and pace can be customised by distance. Another big omission is the lack of advice either pre, mid or post-run as to how you can improve your performance against a certain metric, something Arion’s competitors do much better. Many of the tracked metrics lack context too and it’s hard, even for a runner with a reasonable level of sports science knowledge, to know whether or not their current performance has been positive or negative, and vitally, why each metric matters. Don’t expect race-specific training schedules either. Arion doesn’t offer plans to help you prepare. It’s currently all about coaching form. On an example test run we compared Arion to Lumo Run (belt worn), Stryd (foot pod) and Garmin's Running Dynamics pod. Arion clocked cadence much lower than all three. Gamin had our average at 176 SPM, Lumo at 183 SPM and Stryd at 179.6 SPM. The GPS stats all came up fairly close with Arion coming in slightly longer than the others at 6.13 miles, Lumo 6.04 miles and Garmin 6.01 miles, Stryd at 6.02 miles. When it comes to foot strike and balance we had some question marks over the accuracy of Arion’s readings too. Though none of the other devices track these, the lovely animations seemed to disagree with the other reported Arion stats. The animations appeared at least to suggest we spent more time mid-forefoot striking whereas the metric readings said we had mainly been heel striking. Our balance – an indication of how symmetrically you run – was 0.0% which suggest we ran a perfectly balanced run. Again from past tests we’d suggest this is highly unlikely. We tested on iOS, though there is an app for Android too. Overall the app and the web dashboard lack the clarity of explanation that you get with products like Lumo Run. Metrics are defined but there’s a lack of context. Results for each metric are displayed with their measurements and a single word of descriptive feedback that’s not easy to decipher, plus a percentage score that's not immediately obvious as to what it means. There’s a huge amount going on, particularly in the dashboard, but on the whole it’s not that intuitive. There’s a lot here that needs to be learned, with not quite enough explanation to make that easy to achieve. It’s not just understanding the sports science that underpins what you’re being shown either, knowing how best to use the dashboard takes support too. There’s lots of information hidden behind taps you wouldn’t instantly know to make. For example, in order to access an explanation of each metric in the app, you first have to start a Quick Start run and then select technique run, before tapping the pre-loaded metric to switch between metrics and then tap on the info icon next to the one you wish to learn about. That said, the web-based dashboard offers up some really nice trend charts for each of the main biometrics and the real time heatmap visuals that show exactly where the pressure is with each foot strike are excellent. There’s a sense here that there’s a hugely useful tool that’s still trying to find its feet in how it presents all the data in a digestible and accessible way for runners of all levels. Is this the most important heart rate metric that you need to follow? When it comes to syncing, the flow of data from the pods to the smartphone app was instant and seamless, as you’d expect for a real-time run coach. Something Polar and Garmin could learn from. But when it comes to playing nice with third party products, apps and services Arion has big gaps. There’s no sync with Strava, it’s not compatible with Zwift Runnig – unlike the Stryd sensor – and there’s currently no smartwatch or running watch integration, meaning there’s no way to get your vitals onto your wrist. Something runners who don’t want to wear headphones will demand. We’re told smartwatch hook up is in the development pipeline though. Arion claims you’ll get 7 hours of run time on a single charge and we found that to be just about right. We got through a week without having to charge, with 2-3 runs of up to an hour and one longer run. We found that one of the pods often ran out of juice first – we presume that’s the pod doing the GPS work though there’s no indication on the sensors which is the GPS pod. You can see this in the app. You can save some power by switching off or adjusting the brightness of the LED lights. Unless you’re using them for added safety in the dark we’d certainly recommend it, as otherwise their only purpose is to tell you the pods are connected and you can see that in the app. That’s unless you want to change the colour of the pod lights to match your shoes. A nice touch, if a bit of a novelty. Charging involves clipping both pods onto a single unique cradle powered by micro-USB. It’s quite a neat system that solves the problem of needing to charge two pods simultaneously and it's small and portable enough that you can easily travel with it. Arion is an exciting glimpse into a running future where we’ll all be able to get highly-tailored tips and advice without having to shell out for a running coach. It’ll be based on objective data too, detailing exactly how we run. However, Arion is not there yet. The design needs refinement and the app is almost trying to be too clever in some areas, and suffers from over complication. That said the tech is there and subsequent over-the-air updates mean Arion can get better with age. There’s a Beta label across the dashboard and that’s very much the feeling here – this is a potentially powerful product that’s still feeling its way.